Why Choose AmeriBuilt Steel Structures? Home » Why Choose AmeriBuilt Steel Structures? AmeriBuilt Steel Structures – Are you looking at buying a metal building kit or a steel home? Look no further as AmeriBuilt could be your best choice supplier. AmeriBuilt, a company that has been in the market since 2011, offers today’s most innovative products in the industry. Not to mention, the company also obtained a license to distribute Outback Steel Buildings. 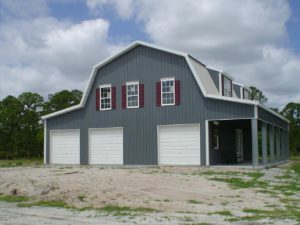 The company also offers its own manufactured and custom-designed steel homes. It designs any type building, big or small, and are sold worldwide. AmeriBuilt has maintained a good track record of performance and takes pride of not having a single complaint listed in BBB. It has also been featured in the Houzz, where users gave AmeriBuilt a five-star rating for its service. What sets AmeriBuilt apart from others? Florida has dozens of steel home companies, but here’s a couple of reasons why AmeriBuilt deserves to earn your business. First, AmeriBuilt is committed to help you with your building project in every step of the way – starting from the design to price quotation. As such, you’d get a better grasp on how much fund you would need to get your home done. Secondly, with AmeriBuilt, you have the option to either build your home on your own or enlist a contractor. The company will even recommend to you local contractors. That alone will save you time and effort in finding a reliable one. There is also something special about their metal building kits. AmeriBuilt ensures that you will not need a welder to construct their kits as every hole is already pre-drilled. Fourth, AmeriBuilt also has various financing programs to assist clients in buying new steel building. Finally, what makes AmeriBuilt unique is that the company uses its very own ‘Outback Calc’. It is specially designed by the company itself that makes price quotation a lot easier. What makes Outback Calc different? Getting a quote for your custom steel home can be a real time-consuming and money-wasting process as you would often spend weeks discussing all of your options with a designer. It is definitely not good for time-sensitive projects. Outback Calc is an innovative solution that is accurate and fast. What AmeriBuilt only has to do is to plug in a custom design and obtain an accurate quote in a few minutes. How long does it take for construction to finish? Under a normal circumstance, it takes four to five weeks to get all the job done. However, the actual time needed to get the structure erected will vary from one kit to another. Here’s a sample timeline for everything to come together. Waiting for the permits to get approved is the biggest hurdle in the completion of the project. Obtaining permits may take longer than three weeks in smaller towns. What are the available options when working with AmeriBuilt? AmeriBuilt provides you all the necessary details you need before erecting your own structure as you please – a pricing scheme for the materials, a stamped engineering plan and a manual assembly plan. Every AmeriBuilt building is customized according to your needs. Hence, you need not look at their company’s website for metal building kits. You will most likely not find them on it, anyway. When it comes to design, Ameribuilt has over 25,000 options available. Once you call the company, a representative from the team will be in touch with you shortly to work with you regarding the proposed building. It will then provide you the initial project needs such as creating a floor plan to deciding for interior and exterior features. You will have the liberty to choose for the features, hence, make the most of your time to figure them out before booking your final purchase. You will be given a free quote anyway so you can get them all together as you start working with AmeriBuilt. Included in the planning is the structure’s slab foundation. You may also request the interior space to be divided as you wish. Since everything is virtually customized, every structure is unique from the other. You can even choose for the exact sizes of the rooms or spaces. More importantly, all the buildings are resilient to hurricanes and winds up to 160mph. They are also engineered to handle heavy snow. After all is set and you’ve approved of the plan, the quote is sent to the engineer for analysis and stamping for your state. Obtaining for the building permits follows as AmeriBuilt works on the fabrication. The concrete work can be either completed by you or you may enlist a local contractor. AmeriBuilt will supply complete plans and detailed assembly manual and ensures that they can be assembled with bolts and screws so you would not need any welder. Work with AmeriBuilt’s representative regarding the building’s design according to your preference. The proposed building is sent to the company’s engineer for approval. Client applies for the building permit from the local government. Final arrangements are made for the erection of the building. The building is delivered to the erection site. If you need gable end, American barns and gambrel building structures, AmeriBuilt Steel Structures has it all for you, too. You may contact them through a toll-free call, request information via online, or personally visit them at their office in Florida.